It’s a bit like Stockholm syndrome. You wish for five minutes peace and yet you miss them as soon as they’ve gone. It took a bit longer this time because I fell asleep three and a half minutes after we’d dropped the boys off at their Auntie’s. I napped all the way from Ayrshire to Perthshire, despite Rod’s questionable music choices, and woke up just as we parked at Gleneagles. My pang for my children was almost immediately smothered by my raging thirst. It was the beginning of an eight hour session – the pace slightly slower than days of old – but the price considerably higher given our choice of venue. There were cocktails and steaks and a fine bottle of Chilean Cabernet Sauvignon. There was even a trip to the bar, a place we normally bypass in our sprint to get back for the babysitter. It’s been recently redecorated and we liked everything about the turquoise walls and art deco style, except the bar stools. We did not like the bar stools. They were far too slippy. An attentive bartender came to try to assist us (the bases were very heavy) but seemed puzzled by our assertion that surely they had had many complaints about the bar stools. Neither of us could sit for long without sliding off. “They’re perhaps designed so that you lean forward and chat to the bartenders,” he helpfully – and diplomatically – suggested. The next morning, having fallen asleep on each other on the couch and stumbled up to bed around 3, we had a lie in. Nobody yelled “milk!” or elbowed us in sensitive parts or demanded Coco Pops, which made a nice change. Instead we went out for breakfast, read the papers and ate poached eggs, like grown ups. The highlight of our prolonged date came at 10.45am when we walked into the Best Spa In The World. We didn’t come out for three and a half hours. My aromatherapy massage was with a Hungarian called Sonny and I can confidently say it’s the best spa treatment I’ve ever had. The foot massage alone was worth the money. The whole experience was perfect from his soothing low voice to the classical music, heated bed and wonderful aromas from the oils. I felt like he kneaded out all the grumpy and left me feeling renewed. I realise this sounds ridiculous. Rod laughed out loud when I said pretty much those exact words outside in the hot tub as the rain fell on our heads. We drove back to the kids in stages, stopping off to visit friends and their new baby and then my mum. Of course when we did eventually get to them, they ran straight past me and into their daddy’s arms and the wall of noise smacked us square in the forehead. They’re in bed now and I’m about to make the lunches, pack the bags and prepare everything for the week ahead – but I’m doing it with a spring in my step. “WOW!” the wee man shouted. I don’t know why we hadn’t thought to bring him here before. For a little boisterous boy who just wants to zoom around pushing or riding on anything with wheels, it should have been an obvious choice. 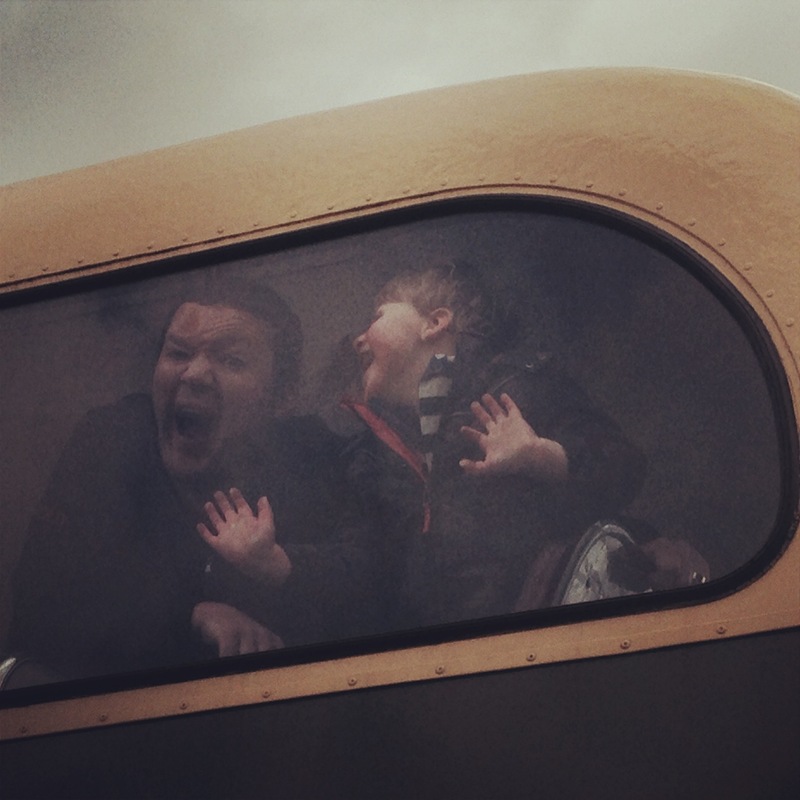 Today we went to a Transport Museum. 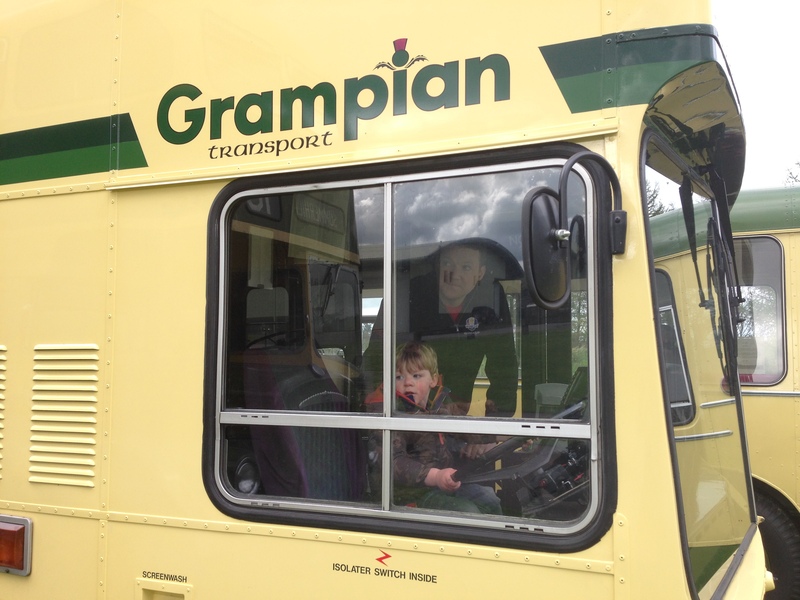 We left Glasgow around the time the fabulous new Museum of Transport opened by the Clyde – and to be honest, I hadn’t even known a Grampian Transport Museum existed. 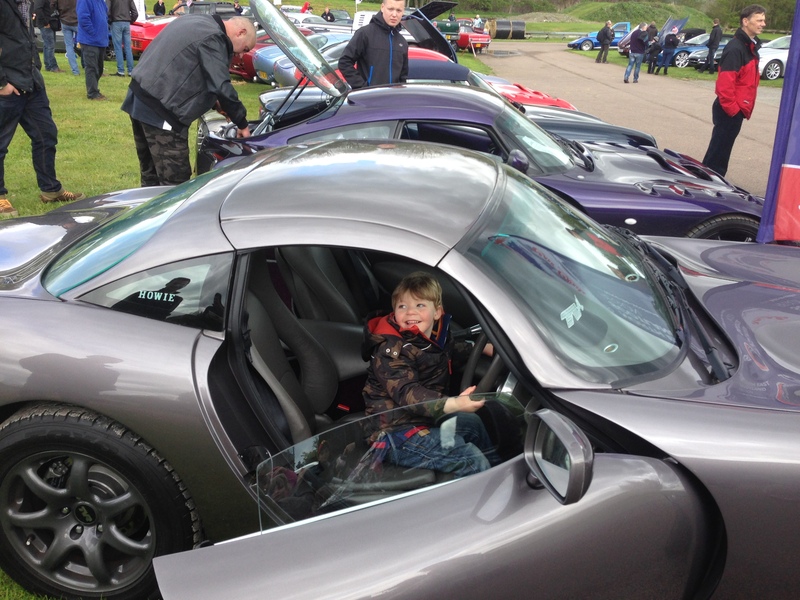 But there it is, only half an hour away from our Aberdeen abode in Alford and today it was surrounded by car enthusiasts and their toys. One of Rod’s customers had told him about it and he casually suggested this morning that we pop by. I hadn’t expected to enjoy it so much. (The old Glasgow one had bored me as a child). 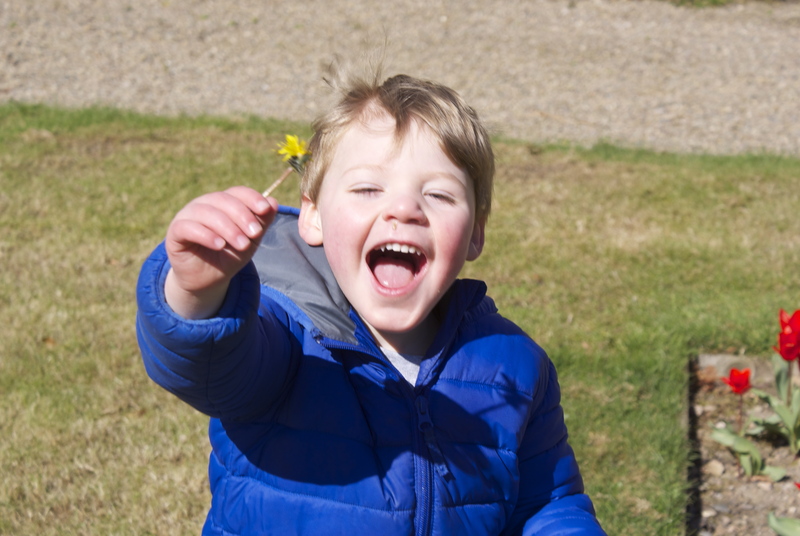 I guess now my own happiness is defined by how well-entertained (and therefore least-troublesome) the wee man is. while I was quite taken with the violet velvet interior and the fact the button to open the door was located under the wing mirror. 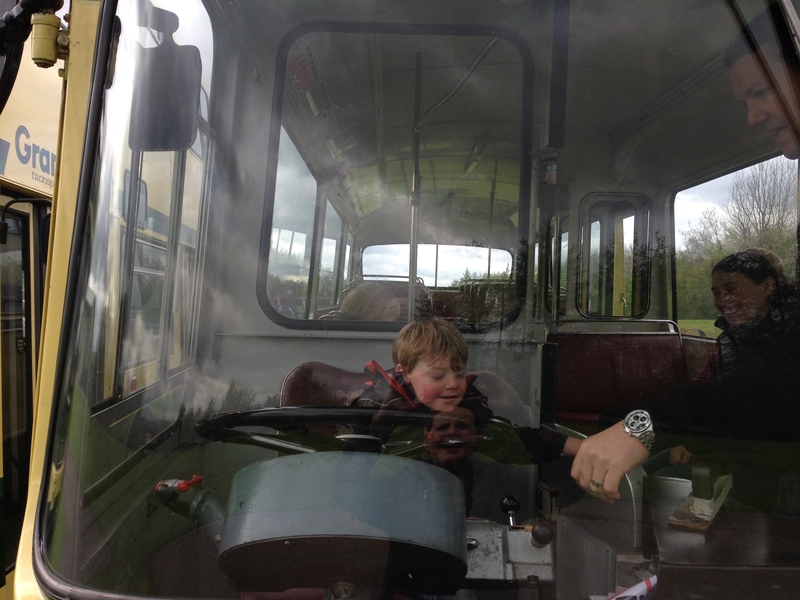 The highlight of this trip past hundreds of thousands of pounds worth of car and social history however, was a bus. A double decker, cream and green, Grampian transport bus. The wee man spent twenty minutes in here before we eventually had to bribe him with yoghurt raisins to get off. 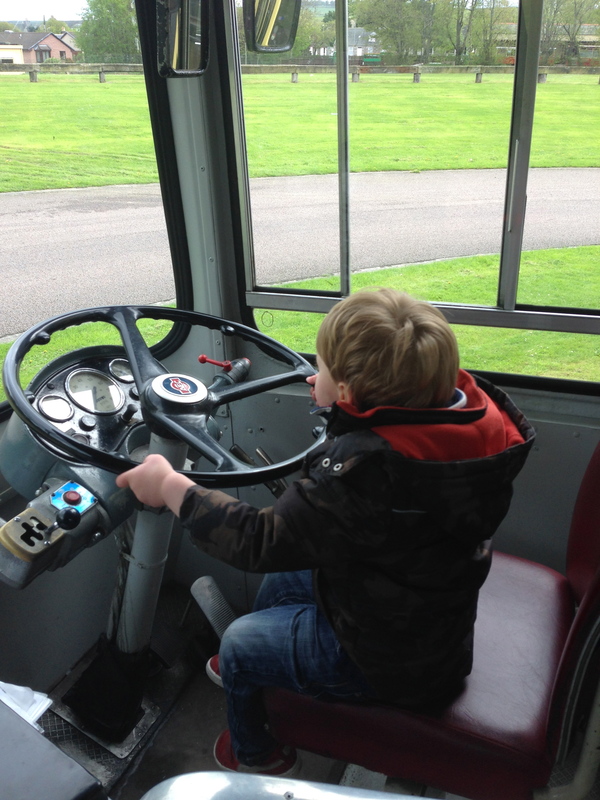 He was not happy to leave – he had another impressive tantrum as we tried to manoeuvre him out past the carriages, turn-of-the-century motor cars and Romani caravan – but the little play park at the entrance proved a small consolation. We’ve been here over a year now and we’d never been to Alford. I reckon the museum (on those days the motor clubs gather) plus the lovely wee bistro across the road for lunch, makes for a really fun, kid-friendly day out. He grabbed my sunglasses along with a handful of hair, while screaming in my ear and kicking at my stomach. “We’ll go back out, mummy just needs her jacket, we’ll go back out,” I repeated, aware I was pleading with him, but saying it over and over allowed me to keep my tenuous grasp on my temper. The wee man had two almighty tantrums at lunchtime today, both times because we took him away from the play park before he was ready. The first time was to go into the cafe for lunch; the second was because I forgot my jacket. The place was mobbed – it was Easter Sunday. My humiliation was nearly overwhelming and Rod’s barely-concealed rage was almost as bad as our sons’. I had to lock the wee man and I in the baby change cubicle for ten minutes to let us all calm down. “Oh, yes, he’s absolutely fine, just upset we took him away from the swings,” I said quickly, in an apologetic tone. “I felt so sorry for you, I remember those days so well, they do pick their moments don’t they? Biggest audience possible to embarrass mum and dad,” she said, smiling. I looked up from my embarrassed purse-rummaging in surprise. “Oh yes, we’ve all been there, I’m sure every parent here was feeling your pain and wishing they could help,” she added. So they weren’t all tutting at us and wondering what was wrong with that child? They weren’t all shaking their heads as I carried him, squirming violently, under one arm into the disabled toilet or sighing at the ensuing echoing yells? Of course they weren’t. I should have known this because only the day before the boot had been on the other foot. I’d enjoyed a peaceful lunch with my mum and on the way out we passed a woman drinking wine while her baby gnawed a cookie in a highchair. “The things you have to do to keep them quiet!” she said quickly. We stopped, smiling indulgently at the wee girl and then sympathetically at the woman. 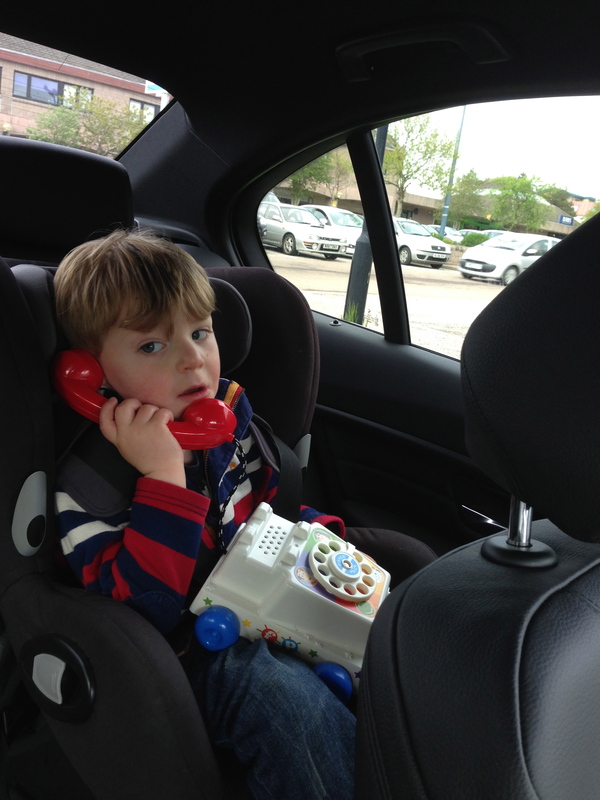 “I totally sympathise, I have a three year old,” I told her. “I’d never usually give her a cookie, but her dad’s been on the golf course every day and the waitress suggested it and I just really needed this one glass,” she stumbled over her words in her completely unnecessary attempt to justify her actions to us. I could have hugged her, I really could. “I’m going to be 46 soon, it’s so hard when you’re older, but we went through so much to have her, 15 years of treatment would you believe?” she added, to our surprise. Clearly this poor woman had been on her own with her baby for too long and was desperate for adult conversation. But you know what, I totally got that too. I wish now that I’d just sat down with her and ordered another couple of glasses. We could have swapped war stories and moaned about how much easier it is for the men and how no one understands how hard it is and generally wallowed while getting pleasantly tipsy. Everyone has these moments where they wonder how the hell they got to this and how on earth they’ll ever cope. And then it passes. For every “Oh my God this is hell” moment, there is an “Oh my God I’m going to burst with happiness” moment. Next time there’s a hell moment I’ll try to remember that the people around me are sympathising, not judging. 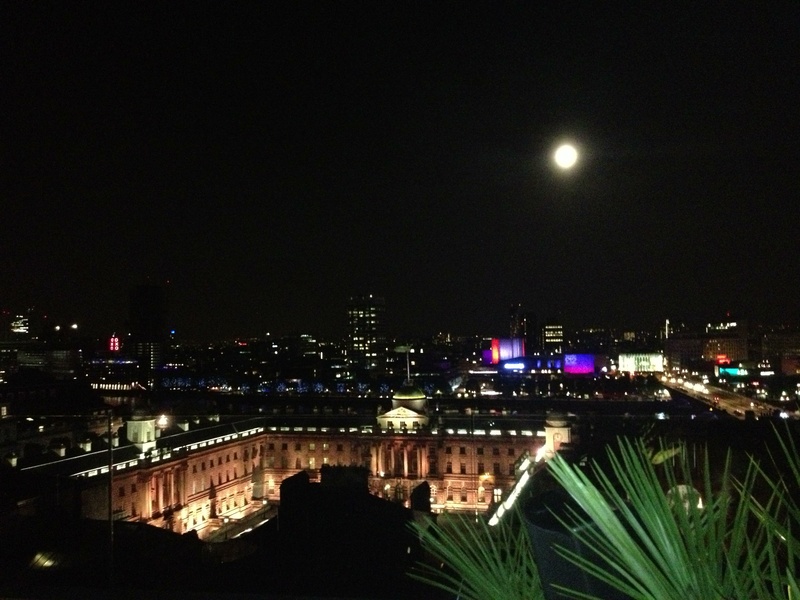 I sipped on my third mojito and tried not to topple over the balcony as I gazed at the London lights, from Tower Bridge to Big Ben and beyond. It would be very uncouth to pose for a selfie, I reasoned, everyone around us was ordering Champagne and lounging like extras from Made In Chelsea. Abi had warned us Radio, in the newly opened ME Hotel on The Strand, was “very wanky” so I was looking forward to it immensely. Gratifyingly, a haughty supermodel-type tried to prevent our entry, claiming they were ‘over-capacity’ and that Darcy wasn’t available. Abi, however, is a barrister. It was highly entertaining watching her calmly argue our case before producing her iPhone and displaying several emails from the owner confirming our reservation. “Wow, really, for all those people?” the Kate-wannabe cried, completely breaking character, and ushered us into the lift, inserting the source of her power (a keycard) to allow us up to the roof. We emerged to the tip of a glass pyramid. Peering through it we could see the hotel reception 10 floors below. Radio was dark and most certainly not full to capacity, with unobtrusive music and an eclectic crowd of suits, ladies and two men in football shirts eating onion rings (no really). Two of us headed straight to the ladies, where there was a queue (naturally) until two young girls tumbled giggling out of a cubicle before posing for pictures in the mirror. “I’ll let you go in by yourself,” my friend said pointedly, with a look that clearly stated she too saw what the emperor was wearing. I was tempted to dust down the toilet seat. We sat out on the terrace in an enormous wicker seat while my London friends identified all the landmarks for me. “That’s Somerset House, they hold art exhibitions and things in the courtyard, and that’s The Shard, it’s very expensive to go up there, but I really want to… There’s St Paul’s cathedral and the Tate Modern….” It really was impressive. I wandered through the bar, people watching and smiling sympathetically at a bearded barman who dropped his flair bottle, and stepped through the sliding glass door onto the south-facing terrace. This one was less crowded, two men and a woman lay back on cream sofas with curtains on three sides sipping Champagne and a couple of men in suits smoked as they lounged by the railings. I noticed a glass box at the apex of the two balconies which was curtained from the inside and roped off. When I rejoined the girls, they told me it was a bedroom and I marveled at the excess. I’ve since Googled it and found it is in fact the glass cupola of the duplex ME suite and would cost me £3180 per night (room only). We left at two and tottered outside to hail a cab. I knew I’d be feeling a bit delicate the next morning but I also knew it would be worth it. If you’re going to go out, you might as well go all out, and tonight had given a whole new meaning to ME time.